This Series is built from a complete chapter of verses from Isaiah 12, comprised of just six (6) verses of Scripture. (1) And in that day thou shalt say, O LORD, I will praise thee: though thou wast angry with me, thine anger is turned away, and thou comfortedst me. (2) Behold, God is my salvation; I will trust, and not be afraid: for the LORD JEHOVAH is my strength and my song; he also is become my salvation. (3) Therefore with joy shall ye draw water out of the wells of salvation. (4) And in that day shall ye say, Praise the LORD, call upon his name, declare his doings among the people, make mention that his name is exalted. 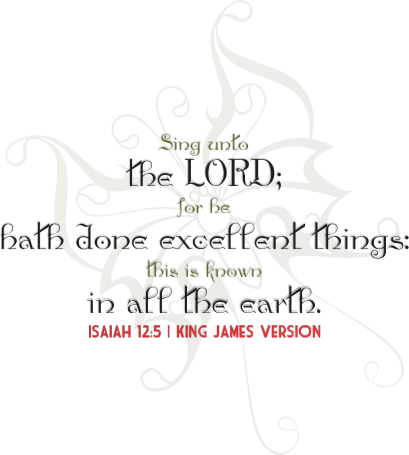 (5) Sing unto the LORD; for he hath done excellent things: this is known in all the earth. (6) Cry out and shout, thou inhabitant of Zion: for great is the Holy One of Israel in the midst of thee.